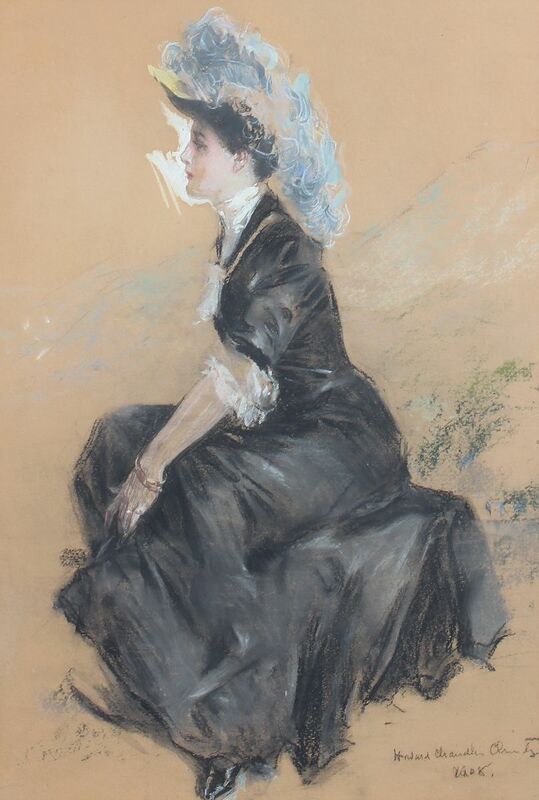 CHRISTY, Howard Chandler, (American, 1872-1952): ''Seated Young Woman in Formal Dress and Hat'', Charcoal and Pastel Heightened with White, sight size 23.50'' x 17.75'', signed lower right and dated 1908, painted frame measures 34.50'' x 28.50''. Provenance: Susanin's Auction, Chicago, Il. June 2013. Sale 122, lot 6163. ''By the Sea'', Cartoons of Sentiment from the 1908 book titled ''The Christy Book of Drawings''. CONDITION: Even overall toning, some darkening in upper left corner, not examined out of the frame, sold as is.